Interested in buying a display case to show off your pocket knife collection? Here are a few things to look for that will help you choose the right one. Pocket knife display cases are a great way to organize your knives. I know I’ve been guilty of just tossing them into a drawer, but that all changed when I finally broke down and bought a case to display my collection in. Storing my knives in display cases has also helped protect my expensive knives from nicks and dings that seemed to occur more frequently without it. In this review, we’ll take a look some of the best pocket knife display cases you should consider to showcase your knives in. Pocket knife display cases offer a great way to organize your knife collection and protect them in the process. Not only do they look cool, but they create a conversation starter with friends. I’ve used a pocket knife display case to house my knife collection for several years and wish I had done it sooner. KA-BAR Knife Display Case (click to check the price at Amazon) – The KA-BAR display case is made of walnut and comes with a soft velvet liner. The hinged top locks in place for safe keeping and it has wall mounts as well. I’ve been really impressed with the walnut finish and it looks great for a center piece. I can display up to 10 pocket knives with it. MOOCA Wooden Knife Display Case (click to check the price at Amazon) – The MOOCA display case is a standard tempered glass case that can hold up to 15 pocket knives. It doesn’t have the locking clasp or the fine detailed wood that the KA-BAR case has, but it’s also cheaper. This is your budget option. Spyderco Spyderpac Display Case (click to check the price at Amazon) – The Spyderco Spyderpac is an innovative solution to carrying and storing pocket knives. It comes with 18 protective sleeves mounted on a heavy duty Cordura material. Each sleeve is see-through for quick viewing and it prevents the knives from rubbing during transport. It even has a shoulder strap. 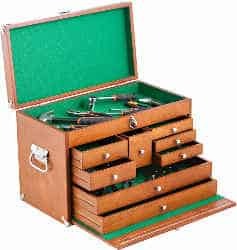 TRINITY Pocket Knife Display Case (click to check the price at Amazon) – The Trinity display case is a multi-shelved wooden toolbox. It has 8 felt-lined pull out drawers which amounts to being able to store 30 pocket knives or more. This display case is the best option for pocket knife organization. I you want the best, this is it. QEES 40-slot Pocket Knife Display Case (click to check the price at Amazon) – The QEES pocket knife display case can hold up to 40 pocket knives at once. 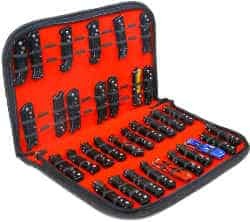 This case is similar to the Sypderpac but holds over twice the amount of pocket knives. Elastic straps hold each pocket knife in place. If you need a display case that is mobile and can hold a ton of knives, this is it. When you sit down and compare the KA-BAR display case to the Trinity, MOOCA, and others, the differences are noticeable. The KA-BAR can hold up to 10 pocket knives which is plenty for my collection. The KA-BAR knife display case has a see-through tempered glass lid. The Trinity and QEES don’t allow for this option. The Walnut wood finish of the KA-BAR display case is quality craftsmanship. Everyone that’s seen my knife collection always compliments it. The KA-BAR pocket knife display case has a hinged locked on the front. The KA-BAR can be mounted on a wall as well as a table top. The burgundy velvet liner is soft to the touch and keeps my knife collection in good condition. Its lightweight and low profile so it doesn’t get in the way. It looks great placed on a coffee table. KA-BAR tactical knives fit perfectly in it. It’s an affordable option for storing a collection of knives. Here is a great clip of what you can expect to achieve with a good pocket knife display case. Adequate storage for the amount of knives you have in your collection. Display cases can hold anywhere from just a couple to over 40 knives. Felt lined shelves and pockets that help protect a knife’s finish. This is extremely important if you handle them a lot. Mobile knife display cases like the Spyderpac are a must if you plan take your knives to shows and events. Tempered glass lids. Display cases with glass viewing lids make great center pieces and conversation pieces. See-through pockets and lids for quick viewing. Quality exterior wood finish for display knives. Elastic support bands to hold knives in place. Shoulder straps and carrying handles. Wall mount adapters for additional placing options. Pocket knife display cases are a great way to organize your knife collection and keep it protected. Not only are pocket knife display cases functional, but they look cool and are a great conversation piece. Below are the different types of display cases for pocket knives and why you may need one. Organization – Rather than have your pocket knives scattered around loosely in drawers and bins, display cases allow you to organize them so that you can find what you’re looking for easily. Protection – Pocket knife display cases are a great way to protect your knife collection from nicks and scratches. Safety – Many display cases have locks that can help protect them from being stolen or used without your knowledge. Affordable – Display cases for pocket knives are affordable and can be found for less than $20. Mobility – Display cases like the Spyderpac can be carried anywhere. It even has a shoulder strap. The QEES case can hold up to 40 pocket knives in a convenient carrying pouch. Conversation Piece – Pocket knife display cases are a great conversation starter. Cases with wooden accents and a glass lid can easily be placed on a coffee table or mounted on a wall. Pocket knife display cases can help remove the mess and clutter that large knife collections always seem to gravitate towards. I’ve been a victim of it myself. It’s easy to just throw my unused pocket knives in a drawer and forget about them, but display cases are so much nicer to look at. And it’s not like we’re talking about a bunch of beater knives here. Many are quality Spyderco, Kershaw, and Cold Steel knives that really should be treated better. Display cases are a great way to protect pocket knives. If traditional display cases aren’t your style, then cases designed for mobility like the Spyderco Spyderpac make perfect sense. I think these cases are a must for vendors who frequent knife shows and events. Pocket knife display cases are extremely affordable right now and are a great way to store knives in a manner that is aesthetically pleasing. Quality knives paired with a nice display case can increase the appeal of just about any room in the house or shop. Why do you need a pocket knife display case? Protecting expensive pocket knives is important in order to help safeguard your investment. Protecting them shouldn’t just be devoted to while they’re in use either. Developing a plan to store your knives so that they retain their value is important for any serious knife collector. Knife display cases are a perfect way to accomplish this. Display cases help organize your knives, prevent misplacing them, and reduce scratching and other cosmetic blemishes from occurring. Pocket knife display cases are also a great way to show off your knife collection. Beautifully displayed knives make good conversation starters which would otherwise be stored in a drawer or bin out of sight. I encourage you to look around and find the best pocket knife display that fits your needs. When your knife collection is protected and organized, you’ll be glad you picked one up. Interested in a new pocket knife? Check out my top picks here.